All Hallows Eve, oil on canvas, 40"x50" (image), 46"x56" (framed), s.l.l. Charles Harold Davis was born in Amesbury, Massachusetts in 1856. He began his formal studies in art at the school of the Museum of Fine Arts, Boston, but he went to Paris in 1881 to study with Jules Lefebvre and Gustave Boulanger at the Académie Julien. 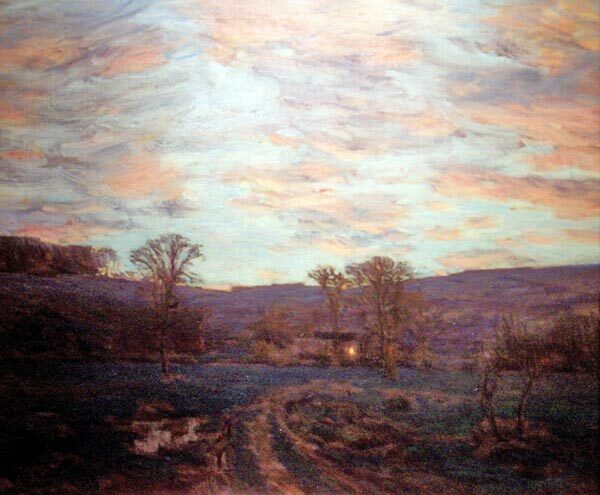 Davis returned to the U.S. in 1891 and settled in Mystic, Connecticut, where he became instrumental in the founding of an art colony, to become the Mystic Art Association in 1913, and where he was eventually joined by John Enneking. 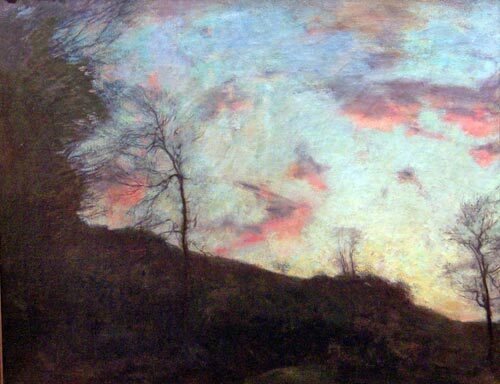 Davis’s early style was Tonalist, inspired initially by his attraction to Barbizon painting while in France, but he later turned to a style inspired by the Impressionist aesthetic and became well known for his cloudscapes. Davis was inducted into the National Academy in 1906, and he died at Mystic in 1933. Davis exhibited extensively throughout his lifetime, his venues including the National Academy, the Armory Show of 1913, the Pan-Pacific Exposition in 1915, and the Paris salons. He won Silver Medals at the 1901 Pan-American Exposition (Buffalo) and the Universal Exposition (St. Louis) in 1904, and he received a Gold Medal at the Panama-Pacific Exposition (San Francisco) in 1915. His work is in the permanent collection of America’s finest museums, including the Metropolitan Museum, the Corcoran Gallery, the National Gallery of Art, the Brooklyn Museum, the Pennsylvania Academy of Fine Arts, the Smithsonian American Art Museum, the Lyman Allen Museum, and the Museum of Fine Arts, Boston. Sundown Under a Blazing Sky, 25" x 30" (image), 30" x 35" (with frame), signed lower left.